Ok... so there is only one gear, but two gearboxes? Schaeffler boasted that its supplies the single-speed transmissions for the Audi e-tron all-electric SUV, which uses two electric motors (one for each axle) for all-wheel drive. Both transmissions have a planetary gear design and are ready for up to 400 Nm of input torque. The rear coaxial unit weighs just 16 kg and has an integrated parking lock for very high loads. Schaeffler started volume production of e-tron transmissions in August 2018 in Bühl and Herzogenaurach in Germany. The company expects that in the future it will be producing 250,000 transmission units per year. Because there are two units in each e-tron, we assume that - if all will be purchased by Audi for the e-tron - up to 125,000 e-tron/e-tron Sportback annually is possible. The start of volume production of Schaeffler’s transmission for electric drives marks a milestone for the E-Mobility business division. Developed and produced in plants in Herzogenaurach and Bühl, the product promises maximum driving pleasure while providing a high level of comfort and optimum noise performance. The transmission is available in both parallel axis and coaxial versions and offers a high input torque with low design envelope requirements. Both variants are fitted in the new Audi e-tron. The coaxial variant provides a comfortable rear-wheel drive and selection of the parallel axis variant on the front axle enables all-wheel drive. The core of the entire system is the planetary gear set with a highly-integrated spur gear differential developed by Schaeffler. Two axles for the perfect drive All-electric driving is gaining ground, but electric vehicles will only gain widespread acceptance if they offer comparable levels of driving comfort and pleasure as their counterparts with an internal combustion engine. Today’s vehicles therefore place enormous requirements on their drive systems. The drive system must not only ensure comfortable driving in an urban environment, it must also be capable of switching to a sporting driving mode with high acceleration. The transition from conventional powertrains to hybrid or even all-electric vehicles therefore requires a high level of innovative strength from both automobile manufacturers and their suppliers. Schaeffler’s engineers found exactly the right solution for the new Audi e-tron: Not just one of the axles is responsible for providing the drive for the entire vehicle, the Audi e-tron can use the electric drive system on each axle. The drive system on the front axle is an electric axle system in parallel axis design, while the rear axle has the coaxial variant. In combination with the electric all-wheel drive, the two electric machines provide impressive driving performance and agile handling. “The entire team is proud of this innovation that we have developed together with Audi”, confirms Dr. Jochen Schröder, Head of the E-Mobility business division at Schaeffler. “The two transmissions for Audi have been in volume production since August. For the future, we expect a production volume of up to 250,000 transmission units per year. Thanks to the modularity of our products, we can adapt the transmission for other applications.” Regardless of whether it is for all-electric vehicles or the hybridization of powertrains based on internal combustion engines, Schaeffler’s modular system is equipped for all requirements thanks to the new E-mobility strategy. Planetary gear set as core In addition to the acoustic optimization, the restricted design envelope of the coaxial drive architecture placed particularly high requirements on the developers. 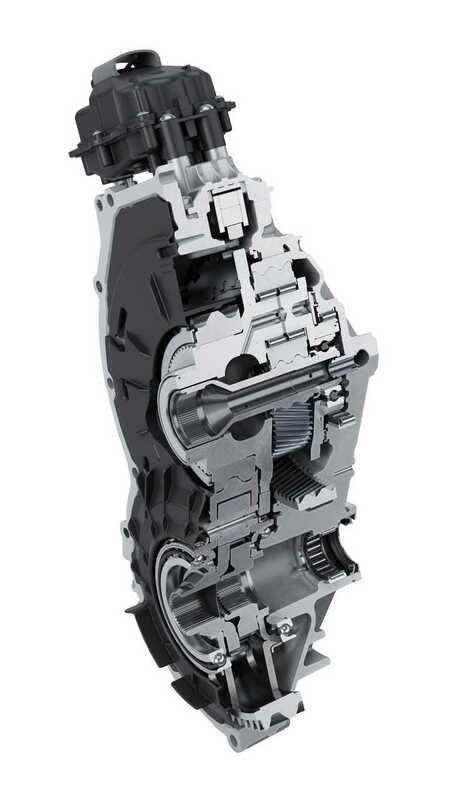 The solution to this problem is the highly integrated stepped planetary gear set combined with an innovative spur gear differential developed by Schaeffler. 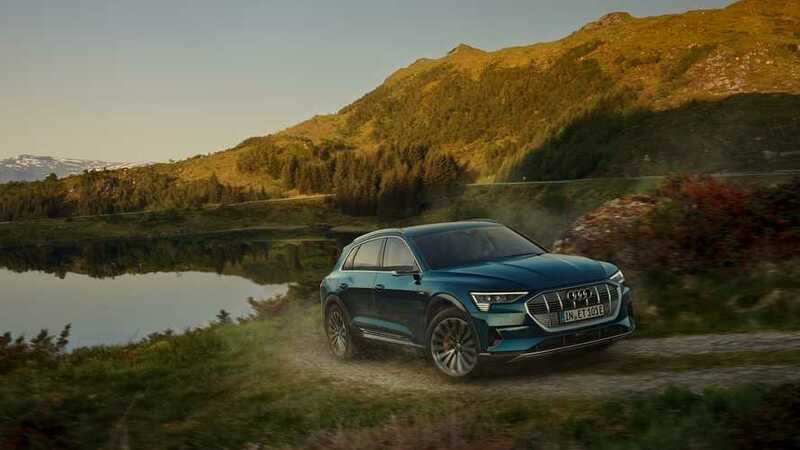 Despite the axial design envelope requirement of 150 millimeters, the transmission concept fitted in the Audi e-tron enables an input torque of 400 Nm with a weight of only 16 kilograms. 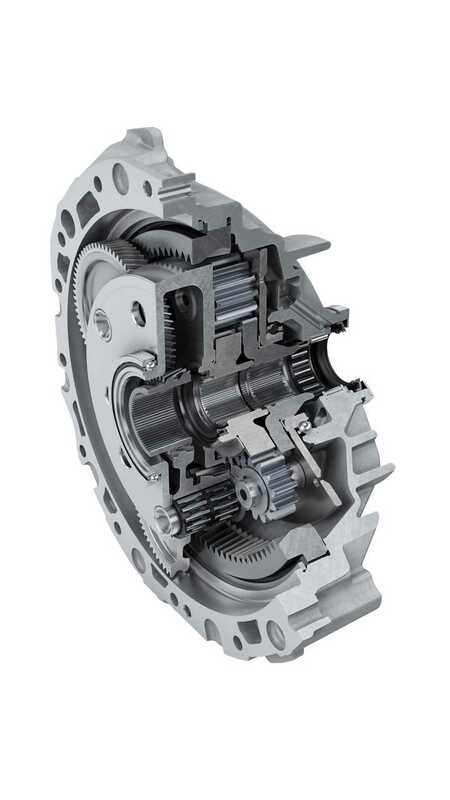 The planetary gear design concept was also applied to the parallel axis drive variant on the front axle. This approach not only reduced the development time and costs, it also optimized the quality of the product. Like the coaxial variant, this concept is also designed for an input torque of 400 Nm and can be combined with an optional parking lock. When the Audi e-tron is driven in normal traffic, the drive is via the rear axle. If more power is required for rapid acceleration, for example, the parallel axis drive system on the front axle is selected. The use of the transmission in the electrically driven Audi e-tron is another important milestone in the E-Mobility business division at Schaeffler. Two-speed transmissions have been produced for the Asian market since the beginning of the year. Production is currently carried out in Germany, but the production line will be transferred to Asia at the end of the year to remain true to the concept of customer proximity. And the success story of the transmission continues: The production of a transmission for a renowned German vehicle manufacturer will start in the second quarter of 2019. Up to 40,000 transmission units will be produced in the Herzogenaurach plant each year.